Want to pick the real-deal preservative free moisturisers from the money-munching-bad-for-skin ones? What Is a Preservative Free Moisturiser? All moisturisers have a basic moisturiser recipe. Imagine a piece of bread, now imagine 2 pieces of bread… they’re still just bread ‘eh… not that interesting… until you add filling between those 2 crusts. Now the magic happens. Bread is no longer just bread. Bread is now a sandwich. You could make the same from a roll, a French baguette, or even a pita bread. All 3 are different, but all 3 can be reborn as sandwiches with a little filling. Moisturisers follow the same concept. Preservative free moisturisers deviate from the classic and traditionally accepted moisturiser recipe. They pull out our final category – preservatives. It’s what it says on the tin ‘eh. The big question is this, can preservative free moisturisers still work? If you stray from the tried and tested recipe, are they still safe to use? Are Preservative Free Moisturisers Safe? Preservatives are used to stop things from going off, they stop food from going mouldy just like they stop skincare from growing fungus. Wherever there is water, bacteria have the opportunity to grow. This is why you could keep a bottle of olive oil or a jar of coconut oil for years without it spoiling, but keep a bottle of milk for the same amount of time and what was once yummy and nutritious is now rotten and sour. Wherever there is water, preservatives are almost always needed. …and I say almost, because clever cosmetic scientists are evolving ways to eliminate them. But my friend, it’s not just as simple as taking preservatives out. Do that and your skin will quickly turn, red angry, dry, irritated and all kinds of inflamed. Because you’d literally and very quickly be spreading bad bacteria onto your skin. Bacteria that upset your skin. Bacteria that aggravate acne and bacteria that cause infection. Not a good look ‘eh… which is the exact reason why preservatives in skincare are very useful. Why Choose a Preservative Free Moisturiser? Preservatives kill bacteria. They also make it a tough environment for bacteria to hang-out. This combination of effects mean bacteria cannot breed in your moisturiser and they also can’t visit without quickly becoming a goner. Imagine a lush green rain forest with a running river, bananas, coconuts and fish, this is like a traditional moisturiser with the preservatives taken out. It’s a bacteria party. Bacteria have everything they need to thrive. Now, imagine a desert… sparse, barren, water-less and vegetation free. This is like a traditional moisturiser with preservatives. The bacteria party has been firmly shut down. This is good news for your skin and bad news for your skin. Let’s start with the good news first ‘eh. Preservatives in your skincare ensure you’re rubbing in a finger-full of hydrating, conditioning moisturiser, instead of an invading colony of harmful bacteria. Easy choice… or so it seems at first. Which brings us to the bad news. Your skin needs bacteria. Exactly like your gut, skin also has a delicate population of bacteria. It’s called your skin’s microflora. Bacteria live on your skin to help keep it healthy and overgrowths or undergrowth’s of certain breeds, cause skin conditions like acne. Putting bacteria killing preservatives on your skin twice a day is very likely to upset your skin’s delicate microflora. As well as killing off what’s bad, preservatives in moisturisers may also kill off what’s good. 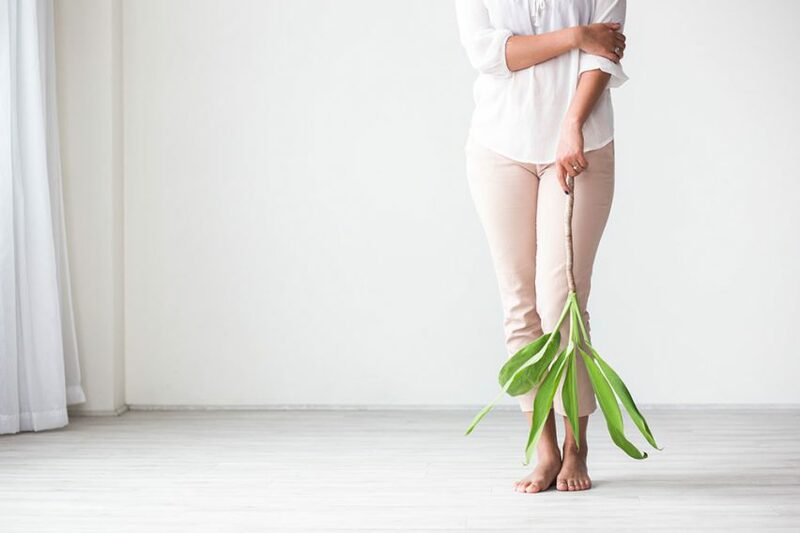 Reason number 1 for choosing a preservative free moisturiser; Preservative free moisturisers help to protect your skin’s healthy bacteria balance. Preservatives are a little different to other skincare ingredients. Instead of being included for the direct benefit of your skin i.e. to keep your skin moisturised they’re included for an indirect benefit i.e. to stop your moisturiser from becoming a bacteria party. While it’s a benefit that has nothing to do with moisturising your skin, it is extremely helpful. However, preservatives as well as killing off bacteria, can also act as irritants, allergens and skin sensitizers. Put a preservative at 100% concentration on your skin and almost everyone would have some kind of reaction. These ingredients aren’t like shea butter, they can’t be used wholly on your skin. Instead, they’re used at concentrations much less than this. Usually sub 1%. At these concentrations for most of the population, most of the time, with normal use, your skin will be fine. For some of the population, some of the time, with normal or abnormal use (i.e. using too many skincare products with the exact same preservative system) your skin will redden and react. Sometimes this may be a rash, sometimes redness, sometimes sensitivity and sometimes dry, eczematous like patches of skin. Generally this is what you call sensitive skin. However, skin can also become sensitive with overuse of skincare products or by using too many products containing the same preservative systems. Old style preservatives like methylisothiazolinone are some of the most irritating/sensitizing. Reason number 2 for choosing a preservative free moisturiser; To treat your skin sensitively and to help prevent reddening, irritation and sensitivity/eczema/inflammation and more. So just how do cosmetic scientists take the preservatives out of moisurisers without them becoming bacteria parties? How do you tell the good skin preservative free moisturisers from the bad skin preservative free moisturisers? 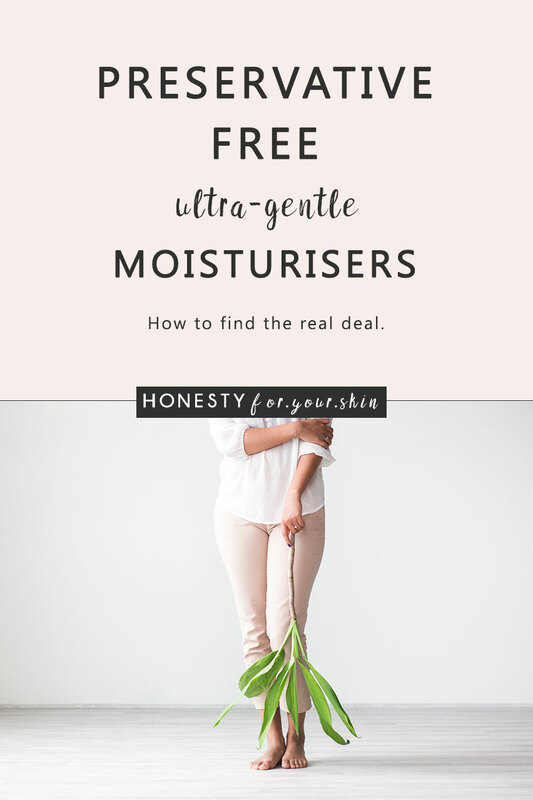 Choosing a good for skin preservative free moisturiser comes from knowing what to look for, the tips and tricks I’m listing below will also help you to identify preservative free moisturisers as well as low preservative moisturisers. Now this list is not comprehensive, however in general these are the major preservative types used in skincare products. They’re also the major active component in preservative mixtures, for example phenoxyethanol, usually also comes partnered with a preservative booster called ethylhexylglycerin, however you are very, very unlikely to see ethylhexylglycerin on its own as a preservative. Keeping this out of our preservative list, keeps things a tad simpler. Air free, preservative free moisturisers, for bacteria are a bit like living in a vacuum. It’s impossible. Bacteria need more than just water to survive, they also need air (like us!). So, if you take air away, most breeds of bacteria cannot survive. To knock off the other kinds alongside yeasts and moulds, these kinds of preservative free moisturisers are usually manufactured in pharmaceutical like conditions which means everything is kept extremely clean. This kind of preservative free moisturiser works because of the way its packaged… in an air free pump. The giveaway for finding an air free, preservative free moisturiser is the packaging. You won’t be able to ‘take the lid off’ you won’t be able to put your hand inside the bottle, you won’t be able to unscrew the top. Another way those clever cosmetic scientists make skincare formulas safely preservative free is to do something called limiting the water activity. When water is ‘free’ it’s 100% available to be drunk up by bacteria. And you guessed it, free water means a bacteria party. However, make that water less available, ‘put a ring on it’ and suddenly bacteria just can’t thrive. This works by using specific combinations of other ingredients like oils or glycerin to bind-to previously unattached water, metaphorically putting a ring on it. Now this is a no-go for healthy skin kind of moisturiser. Ever watched a rogue cowboy film to see them self-treat a gaping wound with alcohol and an ‘over the campfire’, super heated knife blade? See you know how this works already. Alcohol kills stuff. Alcohol kills bacteria. Therefore, putting somewhere over 20% alcohol in a moisturiser can make it self-preserving. Well kind of self preserving, it’s self preserving because alcohol is acting as a preservative. Trouble is alcohol is extremely drying to your skin, especially in high concentrations. Take a read of, ‘Alcohol: The Good, The Bad & How to Tell’ for the whole story. There’s no better way to stay safely preservative free, than by removing what bacteria needs to grow. Remove water and you remove the risk of a bacteria party. Water is normally listed as the first ingredient on an ingredients list if you’re looking at a water containing moisturiser. When you’re looking, it’ll be named as aqua. If you see the word parfum on an ingredients list, it’s telling there’s at least another handful of ingredients than have been listed. Parfum can mean a blend of essential oils, parfum can hide a trade secret of ingredients with other functions which can also be used as fragrance and more recently parfum can hide ingredients used as preservatives. These kinds of moisturisers claim preservative free, when actually they’re using preservative systems which can be listed either as parfum, or as their individual ingredients. So, the catch is if you’re not in the know about this loop-hole, you could end up buying a preservative free moisturiser, when actually there is a preservative system in the bottle, it’s just hidden behind the word parfum. For the whole story, head to, ‘The Legal Lie of Preservative Free’.